Published in Espace Sculpture #22, December, January, February, 1992-93. Diane Gougeon, dédale, oeuvre de chair, il faut tenir la main courante, 1991. Bois, latex, acier inoxydable, crochets, aluminum, plexiglass, moteurs, linoleum, caoutchouc, bois, arborite. 380 x 30 x 290 cm. It is not to belittle this suite of sculptures by Diane Gougeon gathered under the "floating" title, dédale, oeuvre de chair, il faut tenir la main courante, to say that in one way it functions just like furniture. The artist herself writes: "The architectural is indicative of the body's presence"(l'architectural est indice de la présence du corps). Furniture is the intersection where the human body most closely meets with architecture. Rooms, doorways, windows can have extreme variations in shape and size, but tables and chairs must be made a certain way or they lose their utility. Arm rests presuppose arms. Knees and hips must bend one way and not another. The furniture is formed to a body, to the point of often leaving a most intimate imprint carved in a wooden seat.How interesting that the one part of humanity furniture gives us in closest detail is the buttocks! "Some things which are real have less meaning than things which are not real", says Gougeon. Using this philosophy, her furniture which is not furniture makes plain the hidden meanings in the objects with which we surround ourselves. The first thing a viewer notices is that there is hardly any colour in this work. Rather than traditonal sculptural materials like bronze or marble, there are things you would find in a hardware shop, a building supplies yard, or a furniture store. What these anti-art materials are doing is a thing quite unlike the programme of most sculpture called "minimalist". Through their angles and planes, they hope to evoke the most soft-centred of artistic subjects: human emotions and relations. None of these often messy feelings obtrude in a raw way in this very austere work. These objects are more like diagrams and plans. They are schematic views of very un-schematic material. Gougeon puts it by saying that her work is always relating to the environment: the physical environment, or a more elusive inner territory of conception. She likens her work to "built drawings," and like drawings, these sculptures are not only artifacts. Though a sketch consists of paper marked with lines, what is important is the meaning that these lines convey, where the paper and ink is merely a support. As in plans for a building, the drawing represents the promise of an object to be. It is only incidentally an object itself. Diane Gougeon, dédale, oeuvre de chair, il faut tenir la main courante, 1991. Acier inoxydable, cuir, bois, vitre, acier, latex de coulee, gants de maille. Chaque panneau de verre mesure 90 x 120 cm. One has to bend down to get a good look at Gougeon's two pairs of armour-plated arms, which are mounted on two parallel but widely spaced panes of thick glass. Each glass pivots perpendicularly, resting on iron supports, held still only by the force of its weight. This balancing act is the artist's strategy of trusting the spectator, who can rock the undoubtedly expensive pane with a touch of a finger. A touch, however, risks fingerprinting the immaculate surface, loading that trust with a potentially unnerving responsibility not to mar the artwork, or ×heaven forbid× send it crashing to the floor in costly fragments. The very act here of bending over illustrates the manipulations occurring between us and our things. Not only does the human figure determine the kind of furniture built for it, but that furniture in a large way determines us; what we look like, how and where we sit. Throughout her past work (which mainly dealt with gardens and other artificial environments) Gougeon has been fascinated by points of view, and the fact that some are better than others. She has put her viewers high in pulpits, to see a landscape those on the ground can never reach. Also, as in the present work she has forced her viewers to crouch or stretch to obtain the privilege of seeing. The arms one sees looking through these free standing windows are in one piece meeting as if giving a handshake, opposed in the second as if marching away from each other. There are no direct historical references in the armour, nothing except an impression of strength and heaviness. The wooden hands are jointed like those on an art store mannequin. Covering the other hands are chain mail gloves, which look medieval but are in fact the gloves butchers wear when working with sharp knives. Gougeon says she wants her work to function visually, not literarily. In truth, there is little definite interpretation that can be applied. One can see an allegory of cooperation versus disunity, but one set of clasping hands is simply a reversal of the other, and anyways the two hands can never really meet. They are separated by the physical, if not visual, barrier of glass. So, one after another, in close order drill, the paradoxes march by. 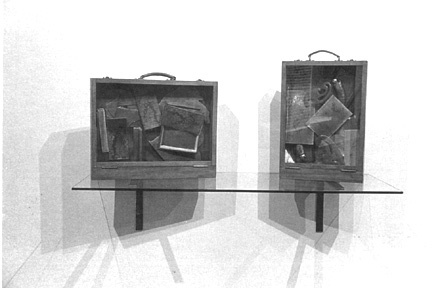 Gougeon asserts that she wanted to present a sculpture without anything hidden, that shows all of its making. She points out the wooden structure of each arm, visible through the glass. Like a clerk in a high-priced boutique, she draws attention to the soft leather which lines the back of each metal segment, just as in many human beings, she says, the outside is rigid, while the inside is fragile. She admits, however, that this strategy of trying to be more truthful simply results in a bigger lie. In order to show the hidden side, she had to finish it more highly to make it "presentable." This fact reveals that not only is there a privilege to points of view, one exists in materials also. The bank president's desk is made of oak and brass, while his clerk uses a formica countertop. Gougeon explores this hierarchy of materials more fully in the third and largest element of the sculptural group. It is a wall piece, something vertical to go with the horizontal arm pieces. Two large panels are completely filled with rows of little metal and cardboard plates, hanging on hooks like keys at a hotel registration desk. Gougeon makes other associations: she remembers reading about similar tag boards set up at the entrances to coal mines, where every tag with its number represents a miner. "Drawn" in the silver and black squares are two figures each shaped like the symbol in the traffic light signal whose appearance tells us it is safe to cross the street.. Running as if towards each other, the figures are identical but reversed, either lovers or a mirror, and they touch at one outstretched hand. These panels are motorized to open and close, resting on rails attached to a background which is latex rubber stretched drum-like over a frame. This is formed in the shape of a heart, not a valentine heart, nor anatomical either, but a heart sign made out of halves of both. The tags make sounds like wind chimes with the gentle parting of the panels. This happens automatically, every four minutes. An early but discarded concept had hidden behind the panels a human hand shape outlined in light emitting diodes, a continuance of the traffic light idea. However, Gougeon thought that this line of symbolism led in only one direction, and would make the interpretation of the piece too tidy and closed. She likes in her work to leave traces of many thoughts and theories, but never enough to carry one to a single conclusion. Touchingly, after all of this mechanical perfection, the drawing is in ways badly executed. The lines don't always meet up together so that they almost seem to be describing a kind of M.C. Escher optical illusion. This is one of only two traces of human hands having worked on these devices, The other is in the big latex sheet itself. which the artist made by pouring the liquid material over a large plastic panel. As much of the work as possible the artist does herself, which has forced her to learn such disparate techniques as metal work and cement mixing. There are patches of light and dark in the smooth, skin-like sheet, where the material dried unevenly. Latex rubber, interestingly enough, has a very low place on the "hierarchy of materials." Most of the time it goes into making medical appliance, which nobody likes to talk about much. However in the last ten years it has become an essential element, interposing itself in interpersonal relations. Hence its presence in this piece, as both skin and barrier. The panels open, and the figures move apart. This happens after a long interval of time because Gougeon, like most artists, hates having her work passed by with only a glance. She wants her viewers to stop by it and consider. The mechanical changes are a kind of reward for doing so, along with the benefits of increased comprehension. This attitude is a little like the artist's method of working, which is rarely to finish things. Her work changes as she makes it and even can change during and after it goes on display. Diane Gougeon, Dédale, oeuvre de chair, il faut tenir la main courante, 1991. Bois, verre, papier, carton, caoutchouc. Perhaps it is a yearning for some degree of closure which informs the last two works in the suite. Gougeon does not like small pieces, and these are the smallest she has ever done. They are two wooden boxes which have had the fronts removed and replaced with glass. Inside are all the maquettes and preparatory drawings, as well as some of the tools which went into the larger pieces. Poured over them and making them useless is a hardened brown layer of excess latex left over from the making of the heart-sheet. Ancient-seeming because of their brownness, they are like the preserved palettes of famous artists seen in studio museums. To the artist herself they are her memories of the work's making. They will always be with her, but as part of the past, sinking into rubber as if they were being subsumed under the flesh. The boxes are portable resumes of the art like the one you take away with you, inside your head.